Ever wondered what that fish was called? Ever wanted to work on a reef survey but didn't know enough about the aquatic life? Well once you're qualified through the PADI AWARE Fish Identification Specialty Course, all of these will not be a problem anymore!!! The PADI AWARE Fish Identification Specialty Course is designed to familiarize you with the skills, knowledge, planning, organization, procedures, techniques, problems, hazards and enjoyment of identifying fish in the marine environment. 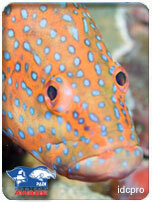 The course is intended to serve as a safe, supervised introduction to fish identification in the underwater environment. During the course you will build your practical knowledge on how to identify fish placing them in their family groups or species types. You will learn how to record your findings effectively and collate your data including habitat and other relevant information. You will practice drawing effective diagrams and recording characteristics of the fish you see so that information can be related at a later date. Also you will learn appropriate diving practices to minimize negative environmental effects while collating your data.